Scottish retailers saw overall sales rise last month as grocers enjoyed a "bumper" month, according to new figures. Food sales rose year-on-year by 5%, while total non-food sales fell by 2%. Overall sales for September were up by 1.1% - or 1.2% in real terms - according to the Scottish Retail Consortium-KPMG retail sales monitor. Clothing performed comparatively well in the non-food category, as did smaller home improvement goods. Growth was also reported in mobile technology, accessories and gaming. Craig Cavin, head of retail in Scotland at KPMG, said: "Clothing was a big winner in September, with mid-season discounts on autumn ranges tempting consumers to restock their wardrobes. "The change in season also positively influenced health and beauty sales, with both high-end and essential cosmetics brands seeing growth following seasonal promotions." Ewan MacDonald-Russell, head of policy at the Scottish Retail Consortium, said the continued growth of online non-food sales was enough to offset the decline in stores. 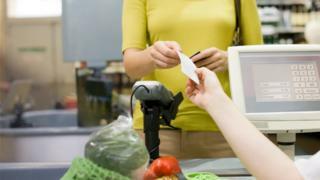 He added: "However, there is no evidence nervous shoppers are committing to larger purchases, indicating that consumer confidence remains at best fragile."